There’s certainly no shortage of quality Italian food in this area; aside from all the great restaurants, we’ve got stores like Carlino’s, Martini’s Italian Market, and Sassano’s to provide quality ingredients when we need them. But sometimes, you find yourself in ACME. 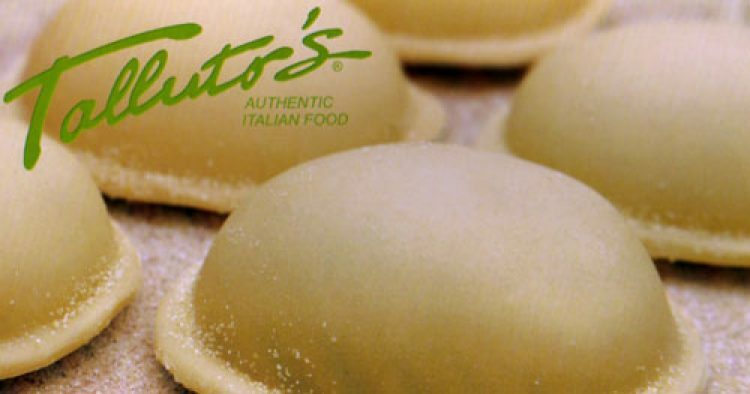 Thankfully, however, frozen pasta from Talluto’s, a local, family-run pasta maker since 1967, is available at most local ACME Markets, as well as Shop Rite in West Chester & East Norriton. Talluto’s specialty is ravioli, based on an old family recipe. These pillowy, sultry treats are filled with whole milk ricotta cheese, imported pecorino romano and chopped parsley combined with fresh whole eggs. Simple, yet so tasty with your favorite sauce (a basic marinara is tough to beat). They also offer manicotti, stuffed shells, non-stuffed pastas, and a variety of sauces. Though they are frozen, we’ve always found the quality of these products to be fresh and full of flavor. For those looking for a more authentic experience, or fresh (not-frozen) pasta, Talluto’s has several area stores, including one in Norristown and one in the Italian Market. Interestingly enough — as this Mario Batali video shows — Talluto’s is neither a small operation, nor do they make their pasta by hand. But they’re still Philly-based and make a great product. @MLD – we do have great pasta choices available in this area. Let’s not forget other locals, such as Scaramuzza’s and P&S Ravioli which are also available in SuperMarkets, Colonial Villages and have local stores. Talluto’s is awesome! I wish it was available in more stores! Talluto’s store in Norristown has a lot more than pasta. It is a small Italian Grocery with prepared food. I stop there on my home from work to pick up an easy reheat dinner. It is in an Industrial Park off Trooper Road, just South of Germantown Pike. I agree that there are plenty of pasta choices in our area. But I think the best by far has to be Springfield Pasta in Springfield, PA. They aren’t available at many retail stores, but oh boy is it a fantastic! So now I ve become very picky…after taking a pasta making workshop in Tuscany. We made gnocchi….Where am I now to get as close as possible?